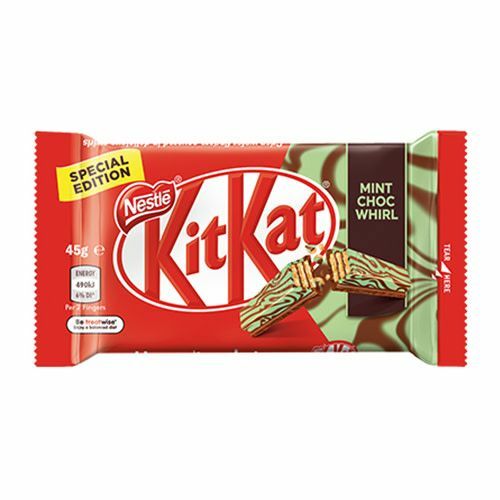 NESTLE KITKAT 4 Finger Mint Choc Whirl Bar contains 4 wafer fingers on a milk chocolate base, covered in delicious swirls of mint flavoured choc. KITKAT is the ideal treat when you're enjoying a break. Enjoying chocolate as part of a balanced diet is one of life's little pleasures. An ideal snack, this 4 Finger contains 2 portions (1 portion = 2 fingers). It has no artificial colours or preservatives. NESTLE KITKAT 4 Finger Mint Choc Whirl Bar uses 100% sustainably sourced cocoa from the NESTLE COCOA PLAN and is certified by UTZ. The NESTLE COCOA PLAN aims to improve the lives of cocoa farming communities and the quality of the cocoa NESTLE purchases. Launched in 1935, KITKAT has become an iconic snack bar ever since. Just unwrap, break off a finger, snap it in two and savour the wafer finger covered in deliciously smooth milk chocolate. HAVE A BREAK, HAVE A KITKAT.